Brief Description:Skate your way through the suburbs, a construction zone, and main street in this delightful daydream. Nick and Penny are stuck in the back seat of the family van, but they'd really rather be skateboarding. Using their imagination, they leave the boring backseat and enter the land of Dream Skate! 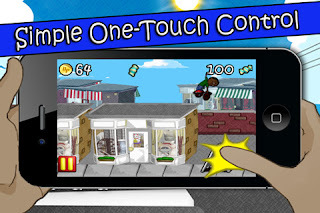 Help them collect candy as they skate on rooftops, telephone poles, and even clouds! Keep an eye out for mail boxes, monster trucks, and anything else that will cut your trip short. Skate your way through the suburbs, a construction zone, and Main Street in this delightful daydream. Make Dream Skate a reality in this addictive simple one-touch game.